Let me begin this essay with a series of qualifications. Since the inception of photography in the 19th Century, there has seldom been any doubt about the inherent quality of photography's function, which is its ability to present verifiable versions of visual reality through the use of artificial glass lenses onto light sensitive surfaces. The degree of accuracy of the reproduction of imagery from reflected surfaces, onto flat ones, has always been its aim and measure. Of course, accuracy alone cannot account for the effect of modified illusions, which is partly what modern photography offers. The last century of photography is the development of a technology of increasing sophistication, in which "raw" data is manipulated and augmented to create altered or improved versions. 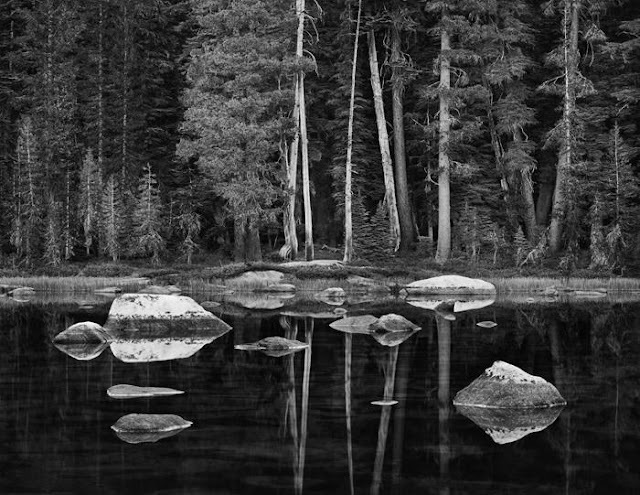 When Ansel Adams said the negative is the score, and the print is the performance, he was referring not just to the playing of the music, but to its interpretation. What, after all, is a "straight" print, if not one version of the process. To change that process, or adjust it, by whatever means, is in one sense, just another means to an end, which, from an aesthetic point of view, cannot be more or less than an aesthetic choice. All art is subject to the vagaries of taste, which is ethically neutral. All attempts to fashion a fixed, defensible bastion of aesthetic criteria are doomed, since there is no final arbitration of value inherent in the artistic realm. Which suggests that all our preferences and pronouncements about the ranking of quality in the arts are opportunistic and arbitrary. They may be constructed around humanistic, or religious, or pragmatic principles. They may begin in utter simplicity, but ultimately, we cannot credit such principles unless we accept them, as starting points, as initial axioms. 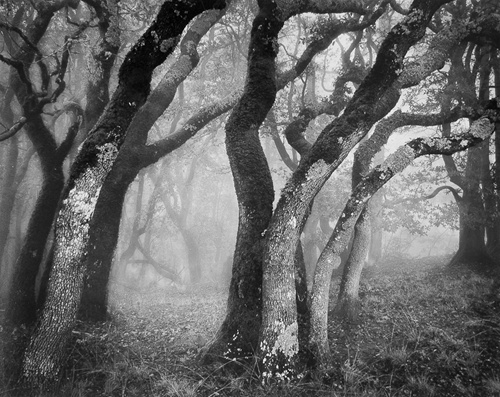 There have been attempts to distort the meaning and function of photography by diverting it into cup-de-sacs, such as Soft Focus, multiple imaging, etc. ; and since the advent of digital technology, the manipulation of the image itself. But there is no reason, other than the arbitration of prejudice, that we should want or need to object to such variations. Straight photography, nonetheless, continues to hold a place of privilege, even as it evolves into new means and materials. As we transition out of organic emulsions to digital projections, the terms of the equation may change, but the solution to the problem has the same general aim. The sense of an idealized photograph implies the existence of an idealized subject, and this is what makes landscape, fashion, photojournalism and documentation, etc., each in its way, compete for progressively ever more iconic, diverting, or synthetic instances. What is the difference between reality and an accurate photograph? What is the difference between a "straight" (unmanipulated) print, and one which has been subjected to various augmentations? What is the difference between an "exaggerated" and an "invisible" manipulation? What is the difference between how I see a scene, or a photograph, and how someone else "sees" it? What is "reality"? Most photographers will readily admit to manipulations, since to do so is as much a boast and a claim, as it is an admission of some degree of artificiality. The delicate balance between a naked "straight" representation and an augmented work, insures that there will always be some degree of "wiggle" room between what we may decide to expect of, or allow, any craftsperson. The issue of craft is paramount in any production where method and materials are as crucial as they are in the chemical processes of traditional photography. We tend to be somewhat suspicious of any craft that pretends to define meaning and quality merely as aspects of the refinement of technique, as (for instance) with poetry. A well-written sonnet may say nothing of importance, may be nothing but an equivocal demonstration of wit or word-play. But with true crafts, of which photography is one, it is often convenient to think that the perfection of method is more important that the actual content of the image. 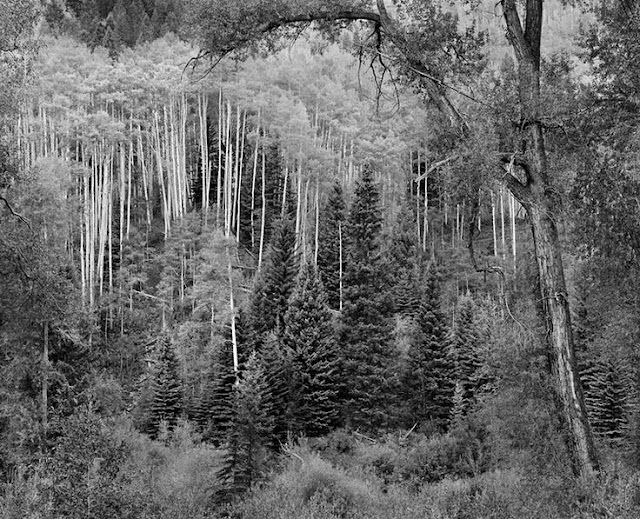 John Sexton began his career as an apprentice of Ansel Adams, and his career has followed a familiar pattern for the kind of craftsman that he set out to be, and has become. It's tempting to suggest that fine art photographers who concentrate, for instance, on landscape can equate fine craftsmanship with the subtle distinctions one encounters in nature. 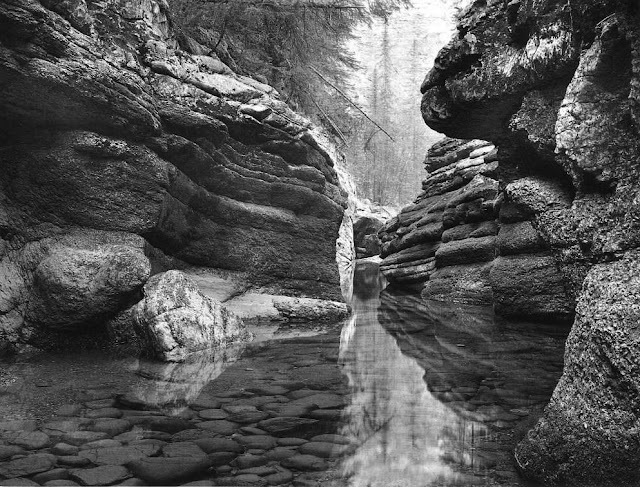 Sexton has said repeatedly that his aim is to transmit the subtlest shades of feeling and impression through the careful exploitation of the finest distinctions of silver gelatin print-making. Like Adams, Sexton focuses on the familiar scenic icons of the American outback, including notably Yosemite, which Adams immortalized. But unlike Adams, Sexton seems less interested in evoking the "heroic" aspects of nature, than in transmitting meditative calm, peaceful states of mind, fragility, harmony, and centeredness. It is perhaps no coincidence that an adroit technician--patient, careful, even finicky--should choose these kinds of tropes to explore and convey. What strikes me, looking at Sexton's work, more than any other quality, is its static fragility. It almost has a feminine aspect to it, a timid sufficiency that chooses to accept whatever mildly pleasant scene chance may offer to his discerning eye. His pictures don't seem to say very much. 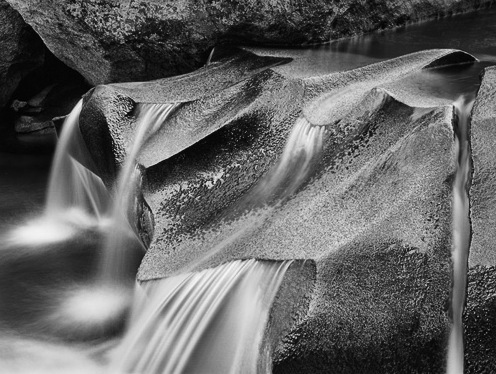 Images of still or silky flowing water, windless forests, posed leaves or rocks or details of architecture seem chosen primarily because they present little challenge, but may yield delicate possibilities in the darkroom. When technique overshadows content, an artist may become over-fastidious and prone to mannerism. This is what I see in Sexton's work: A photographer who has become so preoccupied with finishing and revising and drawing out nuance and innuendo that he forgets about the importance of feeling and significant meanings. Any art which gets so caught up in the technicalities of its craft that it forgets to communicate anything but an appreciation of the function has lost its way. Sexton's passivity and ingratiating distillations leave you feeling as if you needed a nap. There is perhaps some use in presenting images of perfect calm and frozen visual music, for those for whom these are the desirable states of mind. 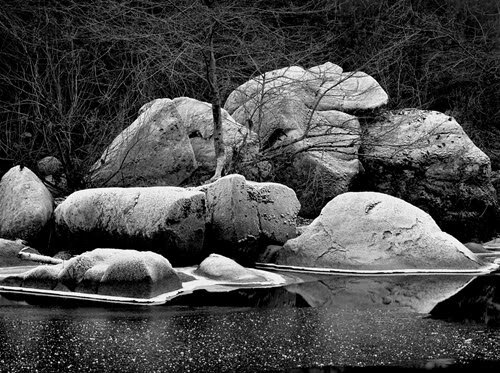 We're all familiar with the drugstore Zen Buddhist approach to the vicissitudes of life in the over-amped Western pursuit of pleasure and wealth, but oversimplifying the potentialities of serious photographic-imaging by promoting it as an aid to nature meditation is nothing but glib salesmanship by critics and gallery-owners, looking to capitalize on the latest new age fad. It may indeed be true that "art makes nothing happen," but whatever is happening should at least occur in the mind of the viewer. Technique can get you so far in any art, but without at least a clear vision of what your craft is for, you may be nothing but an experimenter, content to let your ingenious tricks be the main attraction of your work. Sexton's work is restful, and satisfying in a submissive way. Its only determination seems to be to make everything fit, and clear, but that organized transparency feels ungrounded. His prints seem like problems to solve, rather than experiences to be lived. Regular readers of this blog--if indeed there are any such animals--know that I've had a profound interest in photography, as evidenced by my many blog-posts here about various well-known photographers over the years. While living in Northern Japan in the mid-1980's, I developed an interest in documenting the fascinating landscape of that place, by taking pictures. In the course of that pursuit, I quickly realized that I had an untapped orientation to the visual, as well as an aptitude for composing in two dimensions. After returning to the States, I quickly moved into the view camera field, acquiring various large format monstrosities, including a 4x5, an 8x10, and even an 11x14. I pursued this avocation for 10 years, before abandoning it in 1996, for personal reasons. In the intervening years, I've always intended to return to it, while keeping busy with other distractions such as blogging and antiquarian bookselling. Finally, this Spring, I decided to explore the possibility of making a collection of my images as a published book. In the time since I had actively worked in the field, the technology of print production underwent a revolution to the digital. What would once have taken a lot of painstaking donkey-work with chemical baths and drying racks and mounting boards, could now be achieved inside digital application programs, projected onto light screens, with an almost limitless range of possible adjustments and augmentations of an image file. The possibility of projecting a collection of mounted silver gelatin prints into a book file was a dream I had nurtured in my imagination for over 20 years. The time seemed ripe. Fine art photography book production, using the latest high-tech craft in digital lithography, has yielded stunning examples of the work of the best contemporary photographers in the world. The costs associated with this craft have driven much of the industry overseas. In America, one outfit in particular has continued to set a standard, Dual Graphics in Southern California. Continuing a tradition begun earlier at Gardner-Fulmer, Dual Graphics employs the latest in digital image-making from scanning to final print production, to produce breath-taking monographs, with images that rival the original prints they're made from. 30 years ago, hardly anyone would have thought this possible. But it's become a reality. Presently, I'm about half-way through the production of my book of photographs, the front cover of the dust wrapper for which is shown below. Assisting in layout and design is George Mattingly, a publisher and graphic designer in Berkeley, an old poet and little magazine editor I've know for many years, since our days in Iowa City back in the 1970's. The book is scheduled to be completed sometime in mid-June. Next week, I'll be traveling to Brea, California, to oversee the printing of the signatures. 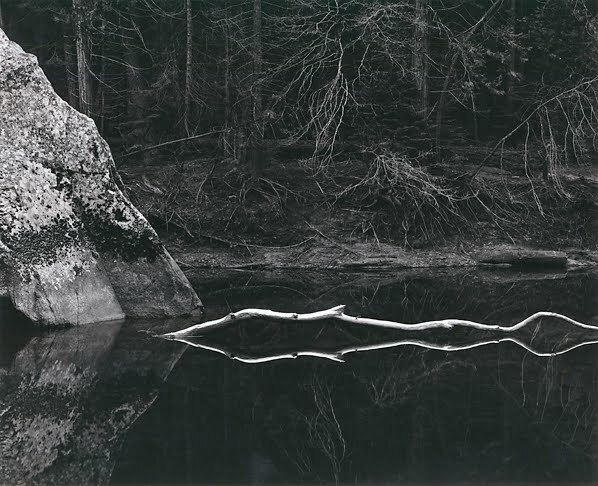 There are 65 black and white images in the book, predominantly landscapes, with a few studies and abstractions. 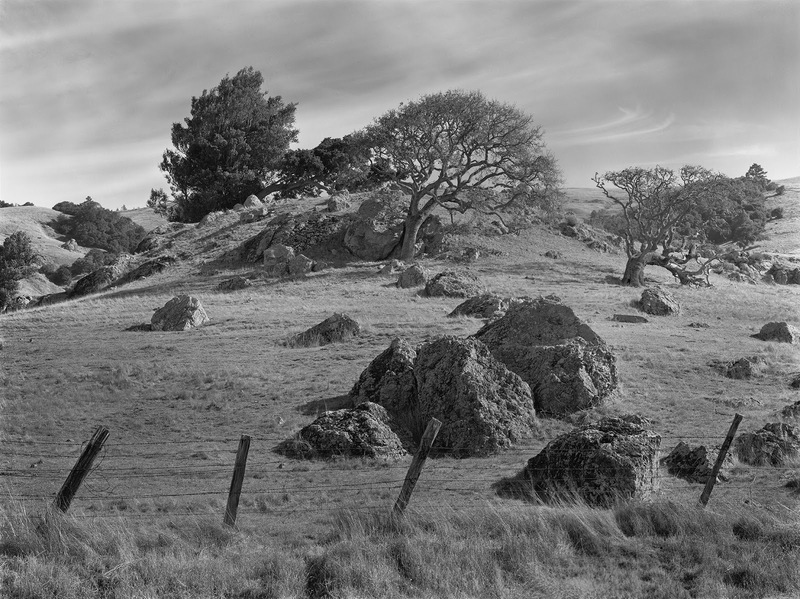 The shot reproduced below is of countryside in West Marin, an area I spent a good deal of time in during the decade of my photographic work. 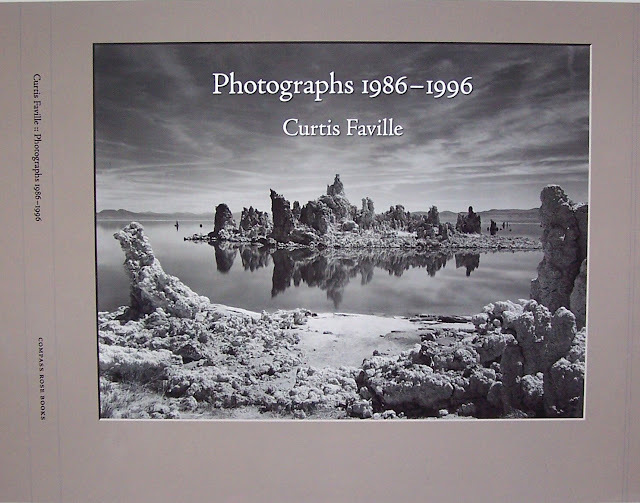 The dimension of the book will be 16x14 inches, a huge tome of a volume, in the traditional "coffee table" format. The reason I chose such a large dimension is because I wanted to print my 11x14 inch contact prints at full scale, without shrinking them to fit a smaller vision. One of the great attractions of very large format, is the incredible clarity with which scenes can be reproduced, without blur or weakness anywhere in the field of the frame. Having gone to such trouble to generate these big prints, I couldn't stand the idea of compromising their potential. The book will be 106 pages, and a $100 price tag, though I suspect that few if any of the copies will be sold for that amount. The run is limited to 300 numbered copies, all signed. I've explored the possibility of national distribution, but I doubt anyone will pick it up. Book distributors aren't much interested in obscure photography books by unknowns, no matter how interesting they are. And I've never been ambitious enough to pursue gallery or print sales. 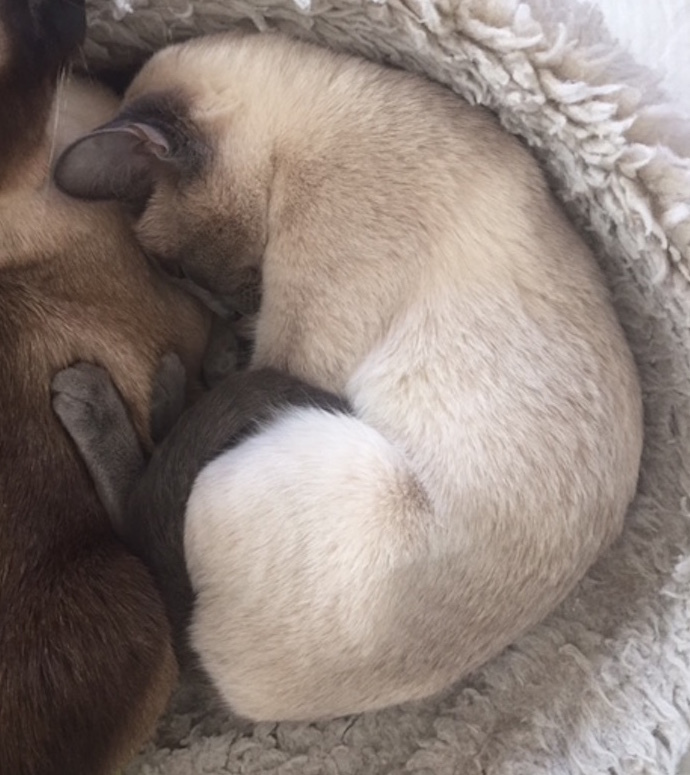 Lily Sabine, sleeping, so curled around her intent, dreaming no doubt of escapades and adventures, from the past, or soon to come. Do dreams serve some purpose in the riddle of survival and genetic mutation? Since we can't know what it feels like to be "inside" another animal, another being, we can only guess what they dream. We assume that other mammals dream, since they exhibit the same twitchiness, rapid eye movement, and distraction which we have learned to associate with active "unconscious" narratives during sleep. Are dreams a passageway into our secret meditations, conduits to the unknown? The surrealists thought so, and psychology and psychiatry are both founded largely on an analysis of the involuntary impulses that generate dreams. We live in the "real" world, while conducting a private series of stories or incidents in our imagination, which are parallel to the real but also creative reinterpretations of it. Perhaps, as has been suggested, dreams are a testing ground or a rehabilitation center which exists to work out problems or try out ideas. The brain may be said to possess a certain autonomy with respect to actual experience, in a sense "acting alone" without our conscious direction. As I get older, my dreams seem to be getting more involved, more tangled with plots and counterplots. I'm not sure why this should be. My life was certainly more eventful when I was younger, and yet my dreams then tended to be briefer, less complex, though often more lucid and powerful in their immediate effect. Many people report that they can fly in their dreams--an astonishing proposition since humans have never been able to fly--except artificially, with balloons, parachutes, or in planes. Is it possible to imagine that humans may someday mutate, naturally or artificially, into bodies that could fly? What an amazing thing that would be.